The RiverHouse property is 36.6 acres. Residents and neighbors walk and bike across it on a weekly and sometimes daily basis. The development proposal seeks to improve these experiences in the following ways. Chief among the improvements is to formalize the Lynn Street to Joyce Street pedestrian route down a set of steep stairs and active parking lot to an ADA-accessible, landscaped path referred to as the Cascade. The Cascade creates a vehicular-free route for pedestrians from Arlington Ridge to Pentagon City. It culminates with a waterfall and courtyard that includes an instant tree canopy with transplanted mature trees. Additionally, the widely popular walking path that loops RiverHouse will remain and be enhanced. Another key connection is the frequently used crosswalk that links Pentagon Row and The James. The development proposes to enhance this connection by creating a pedestrian plaza to the north of the first new building at the intersection of Pentagon Row, The James and future retail at RiverHouse. An improved Joyce streetscape will include street trees, specialized paving and café seating. Building 3 proposes a significant amount of landscape changes to better connect pedestrian and vehicular access with new and existing buildings and Pentagon City. The entry and exit from S. Joyce Street to Building 3 is separated and reversed from typical street layout and confusing. The proposal corrects this by creating a single road for two-way traffic and a landscaped motor court at the building's entry. Pedestrian paths permeate Building 3. A viewing garden can be enjoyed both from at the courtyard and inside the building lobby. A covered entry through this building leads directly to Grace Hopper Park. Opposite the pool is the Grove with meandering walkways and open lawns surrounded by existing and new trees. The Grove is connected to Building 3’s courtyard and viewing garden, which allows a person to walk from the southern parking lot through the Grove, central courtyard and to the front of Building 3 directly to Grace Hopper Park and Pentagon City. 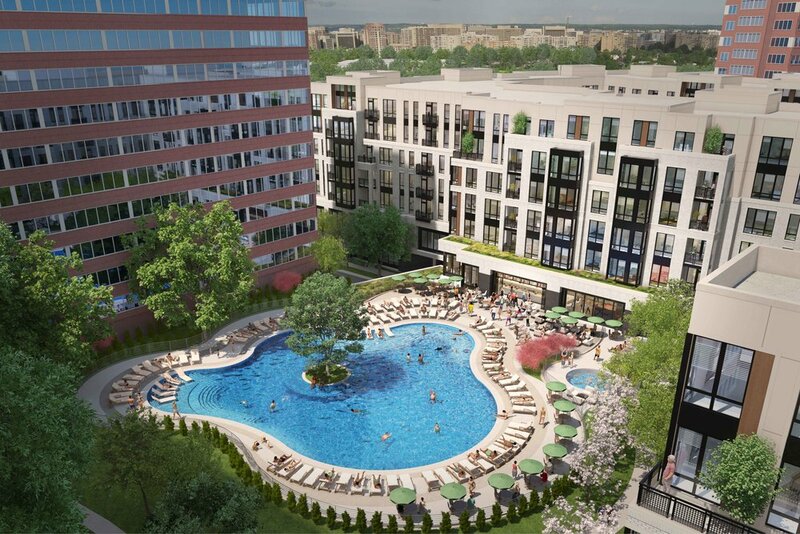 A resort style pool will replace the existing pool to accommodate residents of the new and existing units. A hot tub, swim lanes and direct access to the clubroom are among many of the amenities.